Ideal math manipulative to aid in learning operations and probability concepts. Every classroom should have this set of dot dice and 10-sided dice. Ideal for learning basic addition and subtraction. Set includes 48 x 16mm dot dice in 4 colors, and 24 x 10-sided dice in 2 colors. 72 pieces in sturdy plastic container. 16 mm dice made of acrylic. 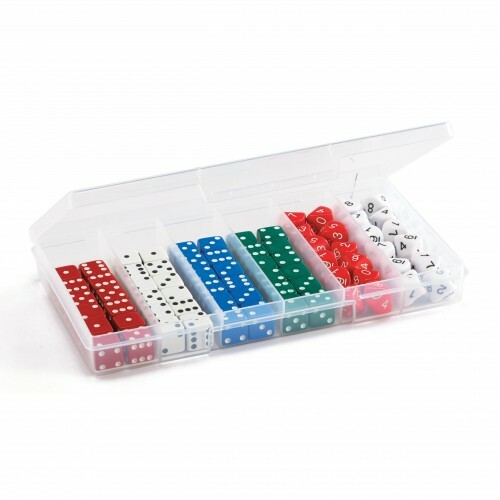 These easy-to-read dice can be used in all sorts of board games or probability activities. Packaged in a convenient, plastic storage case.